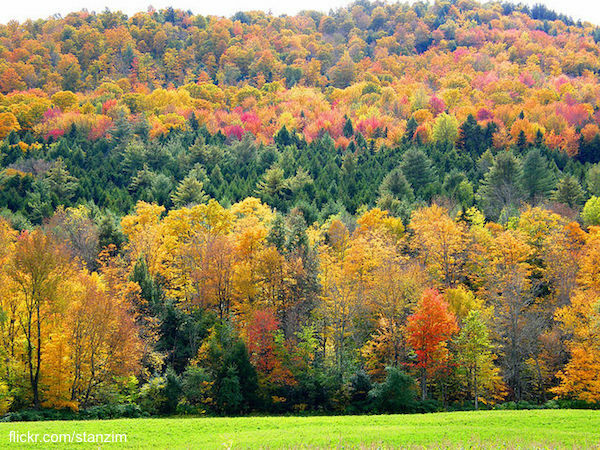 The combination of birch, maple, and beech trees that lines the eleven-mile route that bisects Vermont puts on one of New England’s most awe-inspiring displays of Fall color. Begin your drive in Waterbury (home to Ben & Jerry’s Ice Cream) to Stowe, one of the East Coast’s most popular ski resorts, making your way through three state parks and two state forests along the way. The ski area in Stowe provides a stunning bird’s-eye view of its gorgeous slopes and also provides easy access for great fall hiking. Colors in this area peak around the first week of October but there is still plenty to see come Columbus Day.